Census for Mecklenburg-Schwerin is available at the Family History Centers for 1704, 1751, 1819, 1867, 1890 and 1900. There are also a few early census records for the Duchy of Mecklenburg for 1633-1634, 1677, and 1689 (microfilm #068,934). There are no preserved census records for Mecklenburg-Strelitz. Only a statistical summary is available. The statistical information is interesting, but not helpful genealogically. As an example of statistical information, in 1829 Mecklenburg-Strelitz contained 83,613 persons. The 1836 count for Mecklenburg-Schwerin was 472,171 persons. Male births for that year numbered 8,797 anf females born were 8,219, including one set of quadruplets, three sets of triplets, 220 sets of twins, 2,114 illegitimate children, and 914 stillbirths or those who died before baptism. Approximately 160 persons died of smallpox, 174 women died in childbirth, 3,738 children under 14 died during the year, and 6 persons died who were over the age of one hundred years. The 1867, 1890, and 1900 census information for Mecklenburg-Schwerinis available on microfilm from the Family History Center libraries. The 1867 census is on 357 microfilms. A list of the 1867 film numbers can be found on these pages (see link from home page.) The 1890 census is on 92 microfilms, and the 1900 census is on 755 microfilms. In order to use these films, you will need to know the town your family was from. Use your Family History Center Catalogue either on microfiche or computer to find out the correct film numbers. D.A. = Domanialamt or Domaenenamt (District of a domain or crownland, the revenue of which goes to the reigning sovereign). R. A. = Ritteramt (Knight district). Ritter means knight, a term of elevated free status, originally claimed for performance of military service to a sovereign; privileged "noble"rank. A "Rittergut" (estate of a knight) was formerly owned only by those of nobility. Later others who did not belong to families of nobility were permitted to acquire "Rittergueter." K.A. - Klosteramt (Monastery District). A Kloster is a cloister or monastery. Klostergueter were under the jurisdiction of the Catholic Church. 1704 and 1751 Census Information: The Duke of Mecklenburg ordered Pastors to submit Registers of their communicant members in 1751 (Mecklenburg-Schwerin only). 190 churches listed their confessing members. The original handwritten reports are in the State Archives in Schwerin, and the transcriptions of the records are printed in the eleven books by Franz Schubert. The reports show occupation, names of all individuals in the household 14-15 years or older, and their relationship to the family. The Salt Lake FHC has these books as well as some big university libraries (like Harvard) or other genealogical libraries. The 1704 Mecklenburg "census" is really the first inventory of the population after the Thirty-Years'-War. 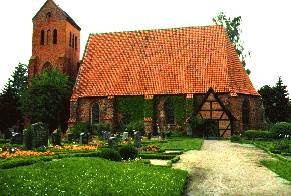 It is compiled from Pastors' reports of communicant members (100,000) similar to the 1751 census (Mecklenburg-Schwerin only). The Immigrant Genealogical Society will search these books for you and provide you with information. If you know your ancestors were from Mecklenburg-Schwerin but don't know the town name, you could find your surname in the indexes. That would tell you which towns to look in. For example, for the 1751 census, volume K lists all occurances of a particular surname in Mecklenburg and tells which towns have people by that name living in them. This includes adult females, since maiden names are also shown. You could use census records to determine the names of the churches where the records of a surname might be found. For example, in the front of each volume for 1751 is a Kirchspiel listing. This indicates the name of the church and the pastor, and then shows the parishes or towns that belong to that church. By coordinating the index locations in Volume K with the church locations, you could determine which churches have your family records. You could trace a family history further back in years. If, for example, you have traced the earliest member of your family to 1770 in Mecklenburg, but cannot find further records in the areas you have searched, using census records might show you where your ancestors lived in 1751 and give you new sources to explore. If you know that your ancestor emigrated from Mecklenburg in 1840, but you can't find the name of the town he lived in, check the 1819 census index for your surname. Get the names of the towns that surname was in. Then look at the films of the census itself for those towns until you find your ancestors. It is not necessary to read German in order to make use of these records. A German to English dictionary and a booklet on how to read the more common German records (available at any FHC) is all that is needed.